The legend of Excelsior begins in 1876 and, by the time they had built their first motorcycle in 1905, Excelsior had 30 years of experience in engineering frames and bike components. Of course, the first bike they built was a speed machine. It was not until 1910 that their iconic 1000cc V-Twin was introduced to an unsuspecting market. With Jake DeRosier piloting the beast, it set a world speed record of 94mph. Soon after this, the Schwinn Company bought Excelsior. Two months after the acquisition, Excelsior became the first motorcycle to officially ‘turn the ton’. 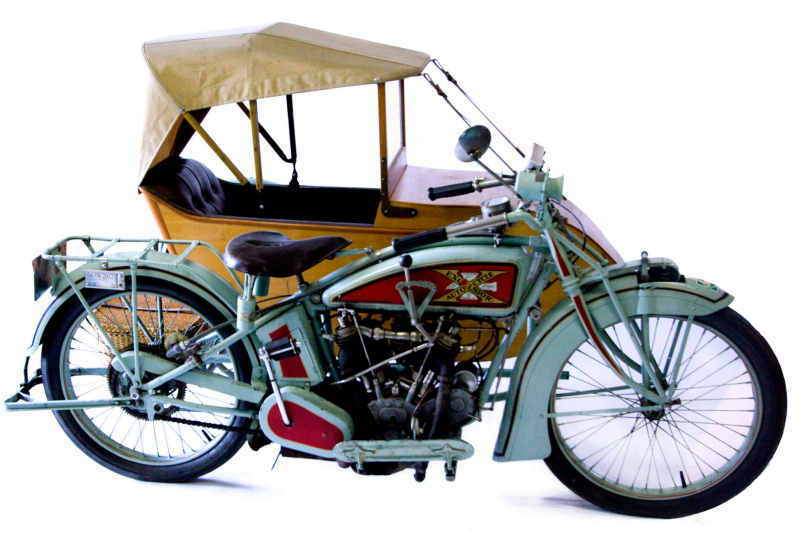 In 1913, it was the first motorcycle to offer “complete control in the handlebars” and, by 1914, Excelsior was proving to be one of the most successful manufacturers of motorcycles in the world. As production had increased to meet the demand, a new factory became necessary, it was state of the art for the time and included a test track on the roof! In 1915, Excelsior delivered the cream with the release of the now-legendary 1,000cc ‘Big Value X’ which was also the first three-speed machine. It was advertised as the ‘Fastest Motorcycle ever’ which, in 1915, was nothing more than a truism. This example is believed to be one of only three that were brought into New Zealand. It originally belonged to Frank and Harry Limerick who were pioneering cycle agents based in Waipawa, it is said that they had trouble selling it because of its excessive power for the day. Its extremely high compression also made it a handful to get going so, with this, they swapped it with Cliff Wyman who at the time had a Rudge Multi. Legend has it that Cliff Wyman was more than happy with the swap and loved to tune up the Big X. It is said that he got the machine over the 100mph mark at the Otane racecourse (two up!). As the years went by, the Big X slowly fell into the barn and came very close to being a donor for a mate’s boat. Enter Rex Scarrott (c 1950) who caught wind of this and convinced Cliff to sell him the bike to ensure it remained intact. From here, the bike was used well and celebrated as a classic piece of American iron. The current owner acquired the machine directly from Rex who was a close friend. Putting aside the iconic nature of the Big X, this machine has a special place in New Zealand motorcycling history and reflects the affection we have for things well made – which happen to go like hell. With only four owners from new and one of only three New Zealand-new examples, this historic piece of engineering is a wonderful opportunity for the true collector of New Zealand motorcycling history.